The Garrison Historical Consortium presents Night Tours in the Garrison Historic Area. This tour is a bit of a thriller and focuses on the macabre side of life in the Garrison. The Garrison Tunnels by night! Details of the construction of the unfinished Garrison Fortress. How ‘Graves End Beach’ got its name. The story of a West India Regiment soldier executed by firing squad at the Military Cemetery. The unsolved John Hislop murder of 1809. Be sure to wear comfortable, reliable shoes for the tour. Bringing your own flashlight is recommended (but not mandatory) as it may help with viability. Come and be a part of history. 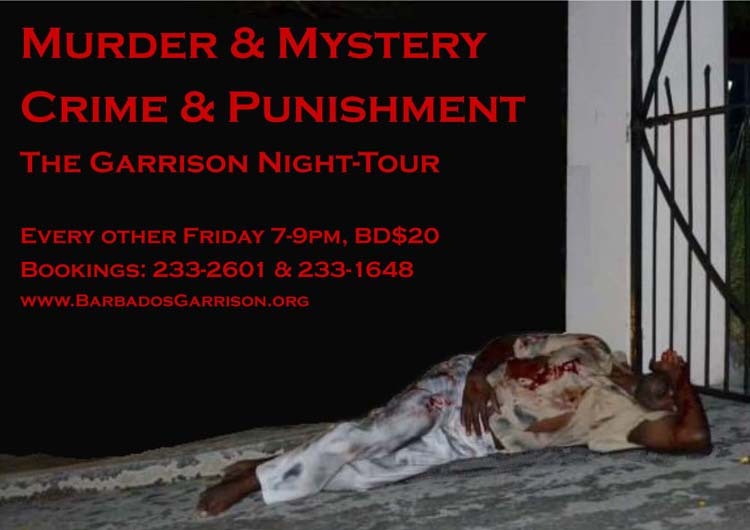 For further details, email info@barbadosgarrison.org.